Well, here we are. We have reached the final destination when it comes to the Road to the Dome. 32 teams had one goal in mind and that goal is to be one of nine teams in the end holding a state championship trophy in the Mercedes-Benz Superdome with the Queen smash hit “We Are the Champions” playing in the background. Now, 30 teams’ seasons are over and there are only now only two teams standing. Both teams had a long journey to get to this point, but now, only one team will get the taste of sweet victory while the other team will suffer the agony of defeat. The Louisiana high school football stage does not get any brighter than this. A weekend filled with great championship matchups kicks off this Thursday and the games will conclude on Saturday. The second game on Saturday will be the Class 4A state championship game, which will feature the two best 4A football teams in the state. In this game, the Edna Karr Cougars will face the Warren Easton Eagles. Both of these teams have shown that they have what it takes to win the state championship, but which of the two teams will be able to get the win in the end? 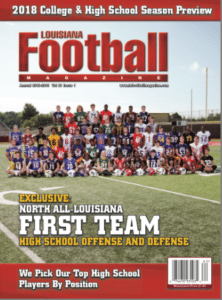 Well, Louisiana Football Magazine’s expert Lee Brecheen has seen all of these teams play and gives his insight on which team will win the Class 4A state championship. 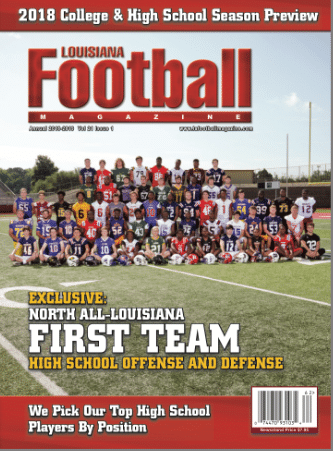 Also, Louisiana Football Magazine staff members Jace LeJeune and Cameron Cerniglia give their insight and predictions on the eighth title game of the championship game week. This week, we will get you all covered in what you need to know for the Class 4A state championship game. Game Info: Saturday, December 8th at 3:30 P.M.
Jace’s Game Preview: Even know the Warren Easton Eagles decided to go for the win against the Edna Karr Cougars on a two point conversion try in Week 10 earlier this year and did not convert in a 21-20 loss, a lot of people knew that they will get another opportunity at the mighty Cougars in the Dome. Unexpectedly, here we are. The Edna Karr Cougars had to go through the always tough Neville Tigers in order to advance to their third straight Super Dome appearance under Head Coach Brice Brown. The Tigers hanged with the Cougars for a little bit as the score at halftime was only 13-7 Edna Karr, but in the second half, the Cougars pulled away with two touchdowns in the second half. It was not the prettiest night for QB Leonard Kelly, who only completed nine of 25 passes, but he also threw for two touchdowns while the running duo of Ronnie Jackson and Ahmad Antoine both added in a touchdown. It was just enough offense as the play of the defense and special teams prevented Neville from scoring in the fourth quarter. The Cougars advance to the Super Dome. On the other side of the ladder, the Warren Easton Eagles have just been plain dominant throughout the playoffs under Head Coach Jerry Phillips and it did not stop in the semifinals against the Leesville Wampus Cats in a 54-10 victory to get back to the Super Dome for the first time since 2014. The star of the night was clearly big time junior running back Ashaad Clayton, who ran for an incredible 265 yards and three touchdowns on only 14 carries. The Cougars will be looking for their first three peat in school history while the Eagles are trying to end the long drought after not winning a state championship since 1942. There will be plenty of athletes galore at this game whether it is on the Edna Karr side with playmakers including Arkansas commit CB Devin Bush, UTSA commit RB Ronnie Jackson, Southeastern commit Michael Corner, etc. 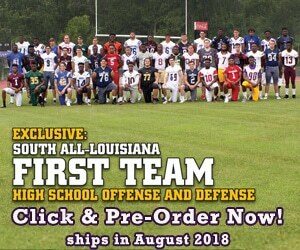 or on the Warren Easton side with four star senior QB Lance Legendre, Clayton, Florida commit DB Chester Kimbrough, ULL commit Jahmal Sam, Ole Miss commit OG Caleb Etienne, etc., this is the best game to watch if you are a college coach or a recruiting fanatic. This is going to be a tough pick, but until somebody beats the Cougars, I am going to have to go with Edna Karr. However, if there is a team that is capable of being the Cougars, it is definitely Warren Easton and I will not be surprised if they do. 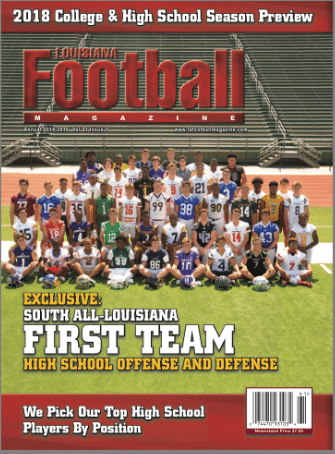 Cameron’s Game Preview: These two teams played in the final week of the regular season and Edna Karr won 21-20. Edna Karr has had a tough road having to go to Bastrop and having to play Neville in the semifinal round. Warren Easton has been able to roll through their side of the bracket. It is tough to defeat a team twice in the same season, and I think Warren Easton will be more motivated after the one point loss in the regular season.